So my usual readers will know that I certainly do some level of paying attention to numbers. I keep track of books read, goals achieved, and other types of accomplishments--many of which are the accumulation of daily-efforts or things that I have managed to turn into habits, thereby increasing my chance to actually complete the goals that I have. 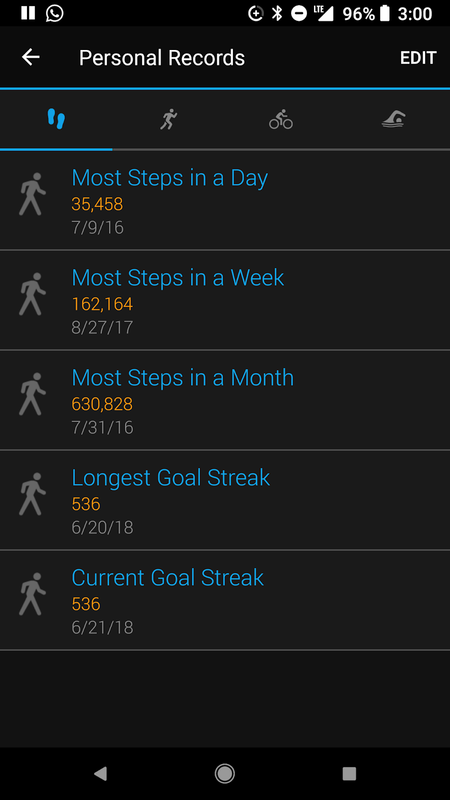 In 2017, I set and achieved a goal of 15,000 steps a day for every day for the whole year. I achieved this goal despite running into occasional sickness and injury. 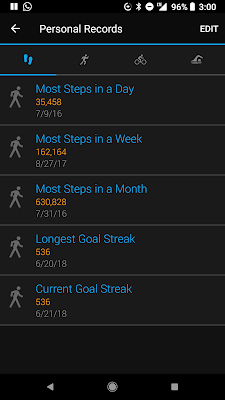 As I turned to 2018, I continued with 10,000 steps minimum a day, which was much easier since that's often covered just by my workouts (running or the elliptical). Here it is at the last day of the streak. I had continued on this progression throughout 2018 until June, when after 536 days (a numerical anagram of 365 days, interesting enough), I had to reset the clock. I had made it a year and a half streak and it all had to stop. In fact, it was stopped for about a week or so as a result of illness. In mid-June, my lower right leg (under the calf down to the ankle on the inside) started to feel a little bit tight. I assumed this was a result of working out and thought it would figure itself out. After all, it was more uncomfortable than painful; like it needed some additional stretching. About a week after it started, I noticed a little bit of swelling, and a few days after that (keeping in mind, I was continuing with working out), it was fully swollen and I was running a mild fever. The next day, I got into my doctor who thought it could be one of two things: cellulitis or a blood clot. There were reasonable grounds for the blood clot. I'm obese and I had recently flown. That day, I was sent off to get an ultrasound (they did not find an alien pregnancy in my leg, alas) to rule out the blood clot. They also started me on antibiotics believing that cellulitis was likely the issue but needing to rule out the blood clot. They found no blood clot and I was sent on my way. I had a follow up the next day with my doctor and it was determined that I needed to rest and keep my leg elevated for the next few days. No exercising. I reluctantly accepted that and it was hard to listen to. Even before taking up running in the last seven years, I had been a fairly active person, always looking to physically engage somehow, whether it would be walking, cycling, using an elliptical machine, or doing yard work. My father always told me that even if my mind has convinced me that I don't want to move, my body likes and craves it (my mind understood this for a long time but really has only embraced it fully in the last decade). He would point to a dog and say that we're not much different from the dog. They often love expending energy and good pet-owners will make sure their dogs get moving as much as the dog wants. I took those ideas to heart and have continually been active. I love the feeling of using my body and expending energy, feeling muscle-sore and some level of depletion from effort spend. In a small sense, being told to not move around, no exercise for a week, and to end my steps streak was a bit of a challenge for me. Part of the challenge is that such movements are now central habits of my everyday life. I rarely take a day off from exercising. I alternate for sure, but I'm usually doing something active with my body every day. Movement for me is a celebration of what my body is and can do; a recognition that the years I have spent in this body I have not always fully appreciated or utilized. I believe I have an amazing body--not in the sense of beauty or superiority. Rather, it allows me to do so many things and it helps me to move through the world. With that, I recognize that it is indeed another aspect of privilege--body privilege--to be able to move largely carefree without worry about my body because of a mixture of genetic and environmental luck. Thus, if I have been granted such a lucky opportunity, I want to be sure to celebrate and recognize that my body can and continues to do wonderful things. 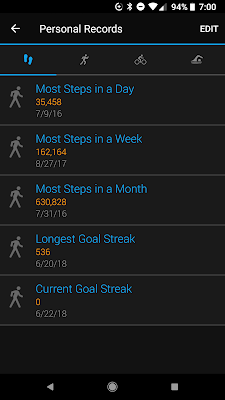 In a big sense, being told to not move around, no exercise for a week, and to end my steps streak was relatively easy. It was easy for many reasons. The first was that it was still a choice. I was not bedridden fro the entire time. I still got up and walked about and ran errands. The second is that I got amazing care in 24-hours. I saw a doctor who got me started on intravenous antibiotics (not my PCP but someone in her office), got an ultrasound (arrived 15 minutes before the appointment; they took me immediately and I left 5 minutes after my appointment should have begun), and had a follow up with a nurse-practitioner the next morning and had my oral antibiotics to take home. There are people with far worse medical conditions that cannot get such a level of care and that is utterly ridiculous. It was easy because I also work somewhere that it is easy and encouraged to take sick time to make sure we are best prepared for the work we do (work that I should say is also not physically taxing and therefore a threat to doing more harm to my health). It was also relatively easy because I have an amazing and caring partner who could help me in whatever way I needed (coming to appointments, asking smarter questions about the whole process than I could conceive, taking time from work to be there for me). All of this is to say that sometimes, pausing a habit or disrupting streaks can be frustrating or feel like one has to "start all over again." This mindset can make things feel overwhelming (e.g. "It will be another year and a half for me to beat my streak!"). But if that is the case where you find the accounting or the disruption to be a problem to the score-keeping, then you might be confusing the trees for the forest. For me, the goal is to celebrate my body and use it in ways that feel good and right. The steps are an indicator of doing that, but the count is not the "doing." Resetting is ok; especially if it is a result of taking care of myself. But even if it isn't--say I have a busy day and don't get to it--that's ok too. Sometimes, you gotta stop and that's ok. Just remember the meaning and purpose of why you go.